As you go up the winding driveway that splits a large lawn dotted with trees, the log cabin of your dreams begins to reveal itself. The hand-milled timber is perfectly stacked three stories high, topped with stone chimneys. The structure is shaped in a V, with the lobby placed directly where the two wings meet facing Whiteface Mountain (which creates a great view from the dining room that sits above the lobby). You couldn’t have dreamt up a more perfect place with your Lincoln logs. Arriving at the front entrance, a wood-covered walkway extends out—their version of a red carpet—welcoming you to a beautiful blend of class and country. As you walk through the front doors, a wonderful world of wood spreads out before you. Between the wooden beams holding up the wooden ceiling, the chairs that seem to be made of branches, the wooden reception desk, and the grand staircase made of … you guessed it: wood, the amount of former trees within the lobby can overwhelm, but don’t let it, because there’s more where that came from. When visiting a place like the Adirondacks, most people book a cabin to get into the whole woodsy mindset. The idea is precious until you feel the urge to go to the gym, order a fancy cocktail, or take a long hot bath. Cue the complaints. 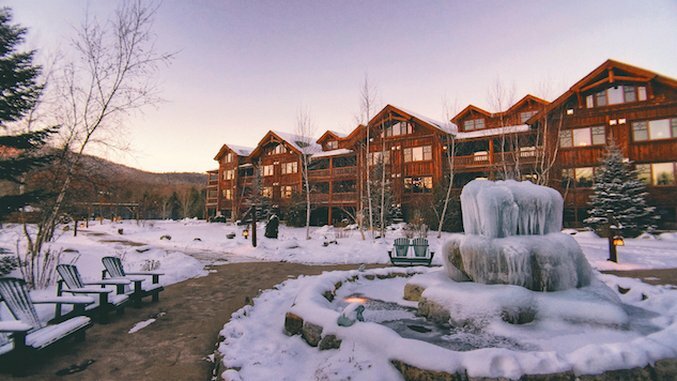 If only you could stay in a cabin without sacrificing the amenities of a fully functioning resort. Thanks to our favorite Olympic luger, you can. The accommodations—most of which are suites—feel more like houses than hotel rooms thanks to multiple floors, in-suite laundry machines, and full kitchens. Add craftsman accents like wood beams in the ceiling; pine trees carved into the staircase; and wood paneling along all the walls, fireplaces, and mismatched armchairs, and you’ve got your very own cabin in the middle of a resort in the middle of the woods. Not only was Barile an Olympic champion, but he was also a genius. Well, there’s the name. That doesn’t sound so good. But the cutest part is that none of the sweet innocent staff have any idea how controversial it comes across. Once I got over that, I was dumbfounded by the amount of stuff to do on the property. If someone ever asks me if I’ve been to Whiteface Lodge, my response will probably be, “the one with bowling, ice skating, a movie theater, snow shoeing, lean-tos … ?” The list goes on and on. And the most impressive part is that they offer all this without feeling like a crappy cruise or a cluttered hotel that’s trying too hard. They have a lot of property, and were smart with it. They built a yurt out of which you can grab skates and hit the rink next to it, and hiking-inspiring lean-tos (pictured above) up the hill so you can watch your friends make fools of themselves on the rink. All of the indoor amenities are in the basement, and nothing is flashy; there’s no blinding marquee over the movie theater or corny music blasting in the bowling alley. Each activity is tucked so neatly into its corner, you might miss it if you didn’t know it was there. And once you do notice, the child inside you will quietly shriek with glee. If the hotel doesn’t have enough for you to do (that’s kind of impossible), Lake Placid will. Shopping and dining options can be found downtown, which is a five-minute drive away (the lodge offers an on-demand shuttle). Skiing awaits 15 minutes away at Whiteface Mountain, and historians and athletes will delight in the still standing—and still used—sites of the 1980 Olympic games. For the spectators, there’s almost always some sort of sporting championship going on around town. Basically, in terms of activities, Lake Placid is like a larger version of Whiteface Lodge.